6 May 2016, at 6:00a.m. EU - The stability recorded in the German and Dutch sow prices at the beginning of the year has stayed true through to the end of April, albeit at low M1 sow price averages of around €0.95/kg and €0.83/kg respectively. With the pound continuing to weaken against the euro during the first quarter of 2016, the sterling value of the German cull sow price increased to 77p/kg by the end of March, up from around 70p at the turn of the year. However, in recent weeks, the pound has strengthened slightly, resulting in the sterling value of the sow price falling back slightly, to just under 75p/kg in the latest week. This strengthening of the pound has reportedly led to a slight decrease in the GB cull sow price, following a period of modest strengthening in the first quarter, although levels remain at historic lows. 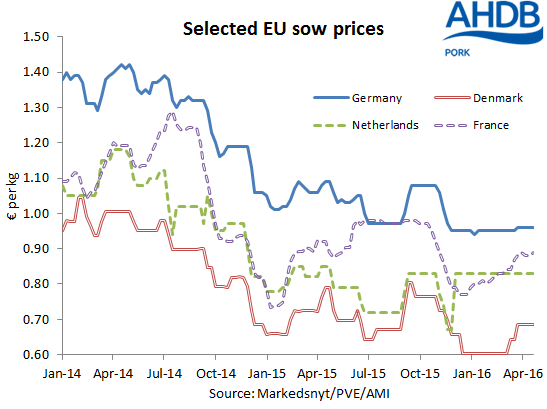 With the German market setting the tone for cull sow prices, this has influenced the stability recorded in other EU sow prices. For German and Dutch markets, no movement was recorded over the Easter holidays. However, the Danish sow price has rallied since then. The French price has continued to increase slowly since the beginning of the year, following its slump in the last six weeks of 2015. With the EU census figures now published, all major producing member states, with the exception of Spain, have shown a reduction in their breeding herds. This indicates a possible tightening of supplies of both finished pigs and sows going forwards, which could potentially support a recovery in the cull sow price later in the year.